Various groups of folk singers reunite for a memorial concert to pay homage to the man who discovered them. The 'mockumentary' seems to be the favorite niche genre of writer/director Christopher Guest. Not only did he star in one of the most well-known music mockumentaries, "This is Spinal Tap," but he has gone on to create many of his own, including "Waiting for Guffman," "Best in Show," and of course, this film, the music-driven comedy "A Mighty Wind." This film follows three groups of folk musicians who are reuniting for a tribute concert for the man who discovered them, Irving Steinbloom. This melodious televised memorial is set to include the duo known as Mitch and Mickey (Eugene Levy and Catherine O'Hara), a trio called The Folksmen (Michael McKean, Harry Shearer, and Christopher Guest), and a nonet known as The New Mainstreet Singers (Jane Lynch, John Michael Higgins, Parker Posey, and Christopher Moynihan, among others), though they only have one remaining member who actually worked with Irving, group founder Steve Lang (Floyd Van Buskirk). "A Mighty Wind" is Christopher Guest's third mockumentary, and like his previous works, this film takes a group of people who have dedicated a lot of time and energy into what is a less-than-mainstream endeavor. Much of the humor here comes from the oddity of the characters themselves and the stories of their unlikely paths to becoming folk singers. Most of the characters are eccentric in one way or another. The wit can sometimes be subtle and is very dialogue-driven as people throw off humorous remarks that could easily be missed if you aren't fully paying attention. Some of the dialogue even seems improvised on the spot, though we don't know for sure if that is the case (but we wouldn't be surprised based on things we've heard and read). Beyond this situational comedy, there is some catchy though intentionally cheesy music that we can't help but enjoy. The songs are sure to get stuck in your head long after the movie ends, even if you aren't a fan of the genre. The lyrics are almost always quite clever and humorous. The entire purpose of the titular song "A Mighty Wind" is to build to a one-line double entendre joke that closes out the number, and we think it is all the more ingenious because of it. The film boasts a tremendous ensemble comedy cast. Each of the actors has excellent chemistry with one another, which is to be expected since almost all of the members of this film have worked together on other Christopher Guest movies in the past. 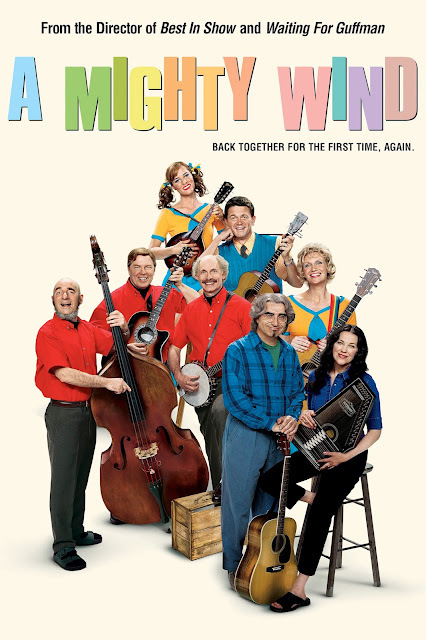 If you are a fan of movies about fake bands or mockumentaries about the seedy underbelly that may or may not exist in the world of folk music, "A Mighty Wind" is a must see. Christopher Guest has done it again!